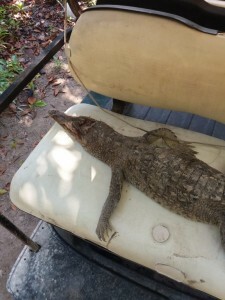 While the world was observing Earth Day on Saturday, April 22nd, Chris Summers, crocodile conservationist from the American Crocodile Education Sanctuary (ACES) was responding to a call about a dead crocodile. Apparently tortured to death, the reptile was found on Friday night, April 21st, and Summers retrieved the corpse the following day in the San Mateo Area. Hoping for justice, Summers reported the incident to both the Belize Forest Department (BFD), and the San Pedro Police Department. “On Earth Day, a day usually reserved for cultures all over the world to come together in celebration and unity for protection of the environment and all She contains, I'm wiping sleep from my eyes. I had to drag myself down to San Mateo in search of a dead croc lying in the street,” said Summers in an emotional social media post. 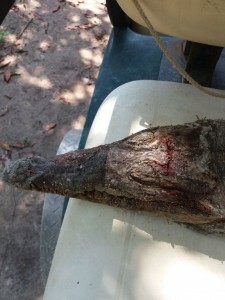 He indicated that it was another case of animal cruelty, as the crocodile was observed with a machete wound to its head and tail. However, he said that the crocodile had ultimately been stoned to death, making this the fourth crocodile death recorded this year due to animal cruelty. After the crocodile succumbed to the torture, Summers said its lifeless body was apparently dragged by a group of alcoholics for their personal amusement. ACES reiterates that American Crocodiles are a world-wide protected species, and it is a criminal offence to kill one. Under the laws of Belize and the BFD, it is illegal to kill, feed, capture, or disturb crocodiles in any way shape or form. A person can be fined up to $1,000 or spend six months in jail if prosecuted. Edgar Correa, a BFD officer, confirmed that the Department received the report, and stated that the investigation is still ongoing. “It is illegal to interfere with all wildlife, and killing them is considered as hunting. Since there is not a Forest Officer in San Pedro, we have to investigate the matter wholly. We try to gather as much evidence to see who was involved. Once that has been accomplished, we will file a proper report, and proceed with prosecution. This investigation does not have a timeframe, and this process might take a while. However, witnesses can play a key role in the matter by giving a statement, and then we can link all of the evidence to the accusations,” said Correa. The Department additionally stated that they have been working hand in hand with the San Pedro Police, and will not hesitate to press charges against the offenders. Summers said he is trying to get witnesses to corroborate the report, since numerous people around the area saw the killing but are reluctant to identify the culprits responsible for the crocodile’s death. ACES continues to try to educate the community on the importance of these reptiles. “Crocs are as much a part of Belize as the sharks, the jaguars, the manatees, Maya temples, and the sand beneath our feet. Crocodiles are important because they are apex predators, and their position in the environment helps keep the environment balanced and in check. Losing any apex predator out of the ecosystem can have a domino effect, which can affect its food chain,” said Summers. The BFD also states that although this is not the first report given, people need to be more mindful of their actions. “Crocodiles have been here in Belize for many years, and people still choose to interfere with them. I’ve seen that the major problems stems when the public feeds them directly, and even indirectly. This attracts these crocs to the coastal areas, which then can become a threat to the community. Instead of reporting it, they [residents] tamper with the crocodile, and even kill it because they are afraid. These deaths could be avoided from the beginning,” said Correa. ACES is dedicated to the conservation of Belize’s critical wetland habitats and protected species through scientific research and education. Permitted by the Belize Forestry Department to address crocodile problems in Belize, ACES also responds to crocodile calls country-wide by calling 623-7920. The public is asked to assist in apprehending those who are responsible for the brutal death of the crocodile. If someone has any information pertaining to this incident, please contact Chris Summers at 623-7920 or the San Pedro Police at 226-2022. All information is appreciated, and will be treated confidentially.